Bonnie Duran met the Dharma in 1982 when she sat a month at Kopan Monastery in Nepal and learned Vipassana in Bodh Gaya, India. Since then, she has taken teachings from many western teachers including Joseph Goldstein and Marcia Rose, as well as Tibetan teachers, Venerable Tsoknyi Rinpoche and Lama Zopa Rinpoche. Bonnie is a graduate of the the Insight Meditation Society (IMS)/Spirit Rock Meditation Center (SRMC) retreat teacher-training program and is now a core-teacher of the IMS Teacher Training Program and the SRMC Dedicated Practioners Program 6. Bonnie teaches long and short retreats at IMS and Spirit Rock and is also involved in Native American spiritual practices and traditions. Dr. Duran is a Professor in the Schools of Social Work and Public Health at the University of Washington and is also the Director of the Center for Indigenous Health Research at the Indigenous Wellness Research Institute. 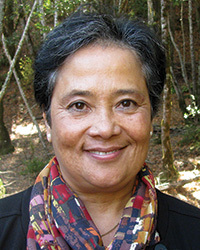 She is a contributor to Hilda Guitierrez Baldoquin's book, Dharma, Color and Culture: New Voices in Western Buddhism and has written for the Harvard Divinity Bulletin, and the Turning Wheel.